Controversial box office collections of Krrish 3 - Our take! Ever since Krrish 3 released in theatres, the comments section on our website and Twitter timeline have been flooded with questions related to the box office collections of the film — Why is there such a huge difference between numbers released by independent trackers like Box Office India (BOI) and the producers of the film? Is BOI trust-worthy? Since quoting a record-breaking figure for the opening day and weekend, results in free-publicity across all news channels and social media, how can figures released by a production house be trusted – after all, with millions at stake with a film like Krrish 3, the producers can quote any figure that they want to! Below is a quick comparison between the 10 day collections of Krrish 3 released by 3 different sources. Filmkraft Productions: Rs 194 cr in 10 days from Hindi, Rs 206.35 including Telugu and Tamil. 1. BoxofficeIndia.com were the first to release All-India figures, which is probably why they are considered to be a trust-worthy source within the industry and by fans. In fact, a lot of well-known trade analysts use figures released by BOI and claim those numbers to be their own! The 202 crore lifetime figure of 3 Idiots was first released by the trade website, which was universally accepted as ‘actuals’ of the 2009 Rajkumar Hirani blockbuster. BOI releases daily figures based on collections from a few theatres in various circuits, which is then compared to other films with a similar release size. For example, sample figures of Krrish 3 will be compared to Chennai Express, as both films released on approximately 3700 screens across India. Since they probably have contacts with top distributors, they are also well-aware if a film is under-performing or record-breaking in one or more circuits. In short, around 20-25% of collections are tracked on a daily basis for bigger films, the final total is just a guess estimate which isn’t always very accurate. Have their figures always been reliable? No, not really. When Hrithik Roshan’s Jodhaa Akbar released, they declared the film a ‘Super-Hit’ with All-India collections of around 63.5 crore net. But on the new version of their website, they’ve reduced the total to Rs 59 crore and also changed the verdict to ‘Semi Hit’. The difference between the two verdicts is huge. Screen captures from 2008 and 2013 below. Jodhaa Akbar is not the only film though. 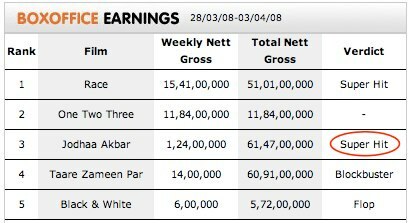 They declared Om Shanti Om as the biggest grosser of all-time at Rs 85.79 crore net. A couple of years later, they deducted more than Rs 6 crore from its total, making it the second highest grosser after Dhoom 2 (Screen captures below). Even the figures of Jab Tak Hai Jaan were reduced by more than 15% when the film was in its third week. 2. Box Office India Trade Magazine: These guys have plenty of sources and usually fetch figures directly from the distributors. They also provide circuit-wise figures on a daily basis. Their figures from a few circuits are at times way off the mark. Also, in recent times they have started quoting trade figures for a few films and producer figures for others. In short, their figures are not consistently accurate and bias towards a certain top star is pretty evident. 3. Figures from the production house: Exhibitors (theatre owners) report to distributors, who report directly to the producers. So only the producers accurately know how much a film has collected. But in today’s times its all about opening day / weekend records and films that are fastest to 100 / 200 crore clubs get nation-wide free publicity across all news channels and social media websites. That results in higher ticket sales, because a film that is record-breaking is considered to be good content-wise too. For example, industry insiders are well-aware of the fact that Chennai Express did not break the opening day record of Ek Tha Tiger. But, UTV released a figure that was a mere Rs 0.12 crore higher than the previous record held by Salman Khan’s 2012 blockbuster. Result? ‘Shahrukh Khan beats Salman Khan at the box office’ was breaking news. It also became the fastest to the 100 crore club by collecting 100.45 crore in 3 days, another big record, more publicity. The film went on a historic run and eventually became the highest grosser of all time. While Chennai Express was a well-made film and thoroughly entertained every section of the audience, the fact that it broke the opening record helped it break more records in the long run. When years of hard work and crores of rupees go into the making of every film, we can’t really blame the makers for not being 100% honest, can we? But the big problem is, this game of manipulating figures could get dirtier. The difference between various trade sources will get bigger with every major release. Those who love discussing figures, may no longer be thrilled by a record-breaking opening from their favourite superstar. In short, it could get way too predictable. Every commercial holiday release featuring Salman, SRK, Aamir and Hrithik, that is even close to the previous record, will be pushed over the line to break records . At the same time, BoxofficeIndia could also be playing a smart game here. In recent times, every media channel has started quoting figures released from production houses and leading trade analysts. Since every fan would want their favourite star’s film to break records, BOI figures were no longer being quoted or trusted. But now, the difference between their figures and producers is so huge that a section of the media has already started quoting figures from BOI. Could well be a publicity stunt from them too! Indicine too has grown tremendously over the last few years, we now have our own set of reliable sources. We publish our own figures for small / medium releases, but currently we do not have enough sources in the trade to track wide releases like Krrish 3, Chennai Express or Ek Tha Tiger. To give you an example, Yash Raj Films produce and distribute their films themselves. How can any one even know where they release their films? How can BOI or any other website, get collections from a fixed rental screen in a small town in Uttar Pradesh? It’s impossible, no matter how many sources you have in the trade! That doesn’t mean their figures are unreliable, it’s just inaccurate! Coming back to the controversy around Krrish 3. We have spoken to a lot of exhibitors and distributors in the last few days, we also have theatre-wise figures from a few centres for the first week. According to our estimates, the Hindi version of the film has collected around Rs 138 crore in its first week and 170 crore net in the first 10 days. The Telugu and Tamil version has contributed around 12-13 crore, taking the lifetime collections of the film to around 182-183 crore. Again, these figures are not 100% accurate, just estimates. Any source, any figure you take.. Krrish 3 is still one the biggest blockbusters of the year. It’s a hugely profitable film for all its investors. Finally, a word of advice. Take your pick and trust the source that you think is most reliable. But stick to ONE source, don’t change it according to your convenience or liking towards your favourite star! Have questions to ask? Post them in the comments section below. @Indicine THANK YOU!!!!! at last you considered my request…i was expecting this article!!!!!!!!! now everybody follows producers and other trades as source of collection. Till now you gave 227cr according to producers so why now its big issue. we should consider their collection for Krrish 3 also. Its fact that it crossed 200cr. Krrish3 will definitely break CE records. The manipulation in case of krrish 3 has been A LOT !!!. Fully support ur view .due to the different figurer from different sources,sometimes they creat controverises. But admin has given the full and best reasonable answers.thanks to incidine team for such reasonable clarification. so finally what is your actual collection to be considered, 182-183 or 206?? LOL SRK is always trendsetter. he was the first who started giving manipulated collections. Now every sources admit, Krrish 3, has the highest opening day collection on Monday. BOI admits, Hrithik broke Salman’s opening day record by a whisker, that also after a year. BOI, also admits JTHJ, life time collection is 102 crores. BOI, also admits 3 Idiots life wold wide collection is highest and with inflation adjusted not a single release is close to it. Krrish 3 is still running and hopeful will break the lifetime record [without inflation adjuated, with inflation adjusted, it will not be able to break the records of 3 idiots]. But i will believe in indicine figures and taran adarsh. They are pretty similar and i think accurate too. is it wrong if BOI.com rectify their mistake and change the status of any movie???? and its not that they have done this for 1 actor, it has happened for many including almost all top stars. Should they just be adamant and stick to their figures, like others????? Dear INDICINE, boi.com is the most trusted website among everone in industry as well so kindly STOP defaming them. Big problem is not the collections but the competion is getting higher & higher! Every fan base are happy when u guyz post their favourite star collections from same sources & are breaking records but are not ready to accept collections of other stars from same sources coz its breaking their favourite star records! From now Hrithik, srk, salman & Aamir movies will be breaking eachother records like fish in water & their fans will be fighting like hell! Indicine u guyz will need more powers for coming movies & years, nice to see u guyz have been using same sources for every movie/actor! definately agree with u indicine its publicity stunts from boi as they have lost readers recently. K3 has crossed 200 cr and its sealed. Anyway,now a days,no of screens have been increased.how can we expect from boi to get each and every information from all centres. 2.Boi declared agneepath as flop on the 2nd day! how can it be possible. it also predicted besharam to break the opening records of other big movies! according to boi,yjhd broke dabbang2 non holiday opening record!how can a movie with comparatively less hype do such thing? ? 3.in the year 2009,a movie 3 idiots did 12 crores in 2nd day with less ticket price and only 1149 screens.then how can a huge movie of 2013 with so much hype, higher ticket price, many more screens and good occupancy do only 15 crores?? how can it be possible? Some ppl are saying that roshans are playing dirty game.i have just one question.if they are doing this then why did they work so hard to give bollywood such a well developed movie? ?they wud have followed an easy path. manipulation can be made with poor content movie too. And srkfans,plz stop supporting boi. i still remember none of u cared about boi at the time of ce. Also,there are some haters who tried their best to spread negativity before release.when k3 became huge,they are just giving excuses. BOI know nothing of Mumbai, West Bengal circuit. Their figures are always low from these two.